Today is the birthday of my father, Cliff, who would have been 91, were he still alive. I miss him so much still, things I know he'd love, things I know he'd find hilarious, things I wish I could share with him. The Freefall Quilt Along was an idea germinated last Fall when I participated in a blog hop for Paintbrush Studio, organized by Bernie of Needle and Foot. I made Windfall using the gorgeous collection of that same name. This quilt is, to paraphrase Yvonne of Quilting Jet Girl, a quintessential Canadian quilt, perfect and timely for Canada's sesquicentennial, 150th birthday on July 1, 2017, although I didn't plan it to be all this at the time. I think everyone knows how dead chuffed (to quote my English mum) I am about the participation in this, my first QAL. I have gotten goosebumps at seeing such a variety of lush fabrics used for my design, in Fall themes, Spring themes, bright and happy themes. I myself created another smaller yet version of my pattern, a cushion cover, aka pillow cover. See below. I plan to release the pattern in short order, and it will contain instructions for both quilts and the cushion cover. This measures 18.5". You can set the falling leaves in a few different ways, because of the 'shadow' HSTs behind them. It was a bit difficult settling on the final layout! Let's see!! I cannot wait to see how these have all come together, quilted or flimsy. I will leave the linkup open until Sunday so you've got a couple of extra days to get 'er done and I will draw for prizes on Sunday evening. Just what are those lovely prizes again? 7. Two patterns from Yvonne at Quilting Jet Girl. 8. 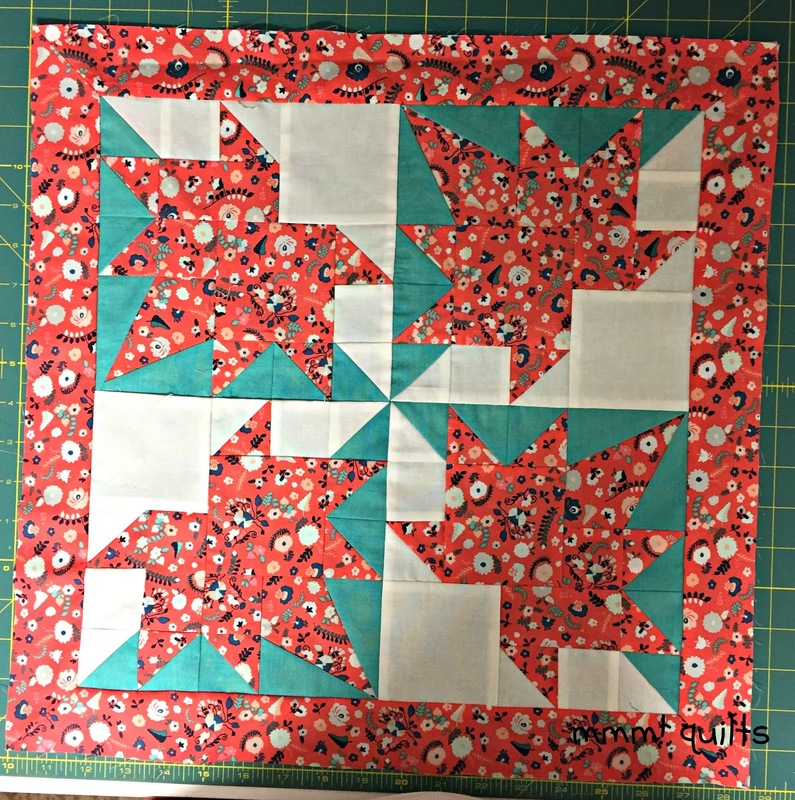 A pattern from Lorna at Sew Fresh Quilts. 9. A pattern from Joanne at Canuck Quilter. 10. A pattern from Beth at Cooking Up Quilts. 11. A pattern from Tish at Tish's Adventures in Wonderland. 12 A pattern from Cindy at Stitchin' At Home. 13. A pattern from moi. Heartfelt thanks to each one of these sponsors who so generously offered prizes for my first quilt along. Heartfelt thanks to each of those who participated, fitting this in amongst various other obligations and projects and life in general. Heartfelt thanks to Tish and to Julie for offering to test the pattern. It would not have been as straightforward without their valued input. Also heartfelt thanks to Jen for testing the instructions of the large leaf shadow point blocks. Wow! All right, let's get this show on the road! Thanks for a great QAL, one I could keep up with! Happy Heavenly Birthday to your dad. I'm so glad you explained it all again today. It seems Freefall was meant to be. Thank you for taking us on this journey. My version is patriotic, for Canada's 150th. 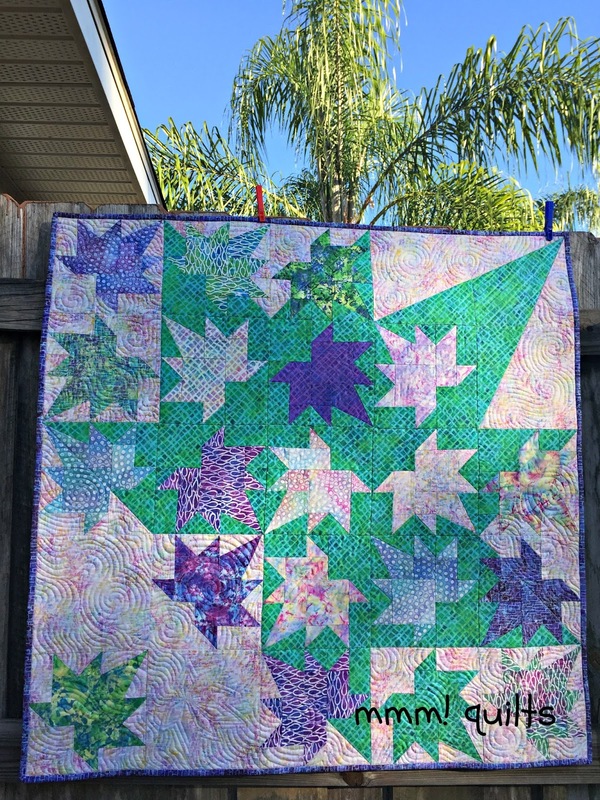 I have 8 blocks partially quilted. Will hold off linking a pic of my flimsy in case the quilting gods are smiling on me this weekend. Not likely, but one can hope. I love that first photo. 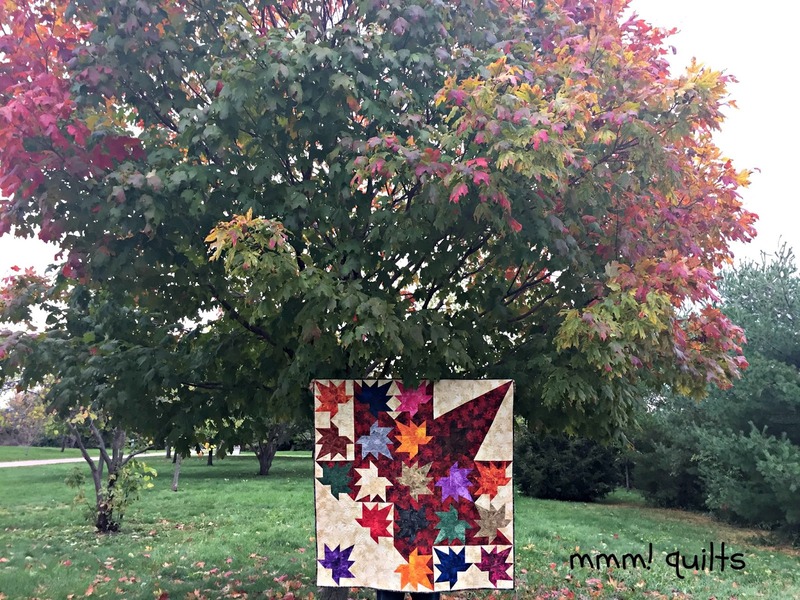 The quilt certainly seems like it belongs with the tree in the beginning of its autumn glory. This is my first year with no father for Father's Day. My father-in-law died at the end of December, and mine died early May. Both were 91. I know what a gap the loss leaves. I am pleased we are all sharing in the birthday of your father, the famous Canadian. The QAL has been a truly A PLUS... success. The pattern, your photos, words, diagrams, encouragement, help and ideas, and so much more, Congrats, a winner in every way. My binding was all done last night, not quite the midnight oil, but too close for comfort. Wonderful ways we have all used fabrics in so many colours to make the Freefall, and every one is truly fantastic. Now for some R&R!!! I had to edit my post, so deleted it from my blog, and now a MAJOR problem with open live writer. I cannot publish it again after fixing the link. I will try and paste it into blogger later on. What a great QAL you ran, Sandra, and I've loved checking out all the links to see what everyone has done. Sadly, no, I didn't take part myself, but I have enjoyed reading all about it as you have been posting the parts to make this beauty. It's been lots of fun quilting along with you Sandra. Where oh where can I get this pattern? Both Windfall and Freefall are so beautiful! I really love that pattern - wish I could have participated in your QAL, but wasn't in the right place, project-wise to start something new. I also love the little one you're making! What a great way to celebrate and remember your famous Canadian. I love the calendar story. Congrats on your first QAL. Good work for which I would like to appreciate you. And lot of congrats and best wishes for Famous Canadian. Congratulations on your first and very successful quilt along . Well done you! You made your dad proud . Not only is your mother dead chuffed but I'm sure she got a quare gunk to see you childer doing so well artistically ! I loved participating in your first QAL and seeing the other quilts and meeting the other quilters in this group. You were an awesome leader Sandra and I say let's do another one again.